Instead of falsely relying on high technology to fix economic problems, we need to balance it with the human dimension: the family; the house. To enable an economy in which one member can work to support his or her family. Eliminating car ownership through the intelligent use of land in this model would decrease the cost of raising a family. Reducing carbon energy. This essay proposes building garden cities,/4 microcosms of the European Community within the European Union. Around our cities are abandoned industrial sites. Where these are not polluted such areas could be subjected to high taxation unless released for the building of garden cities, a mixture of balconied and arcaded buildings and cottages with verandas, with tree-lined landscaping where children can play and learn. 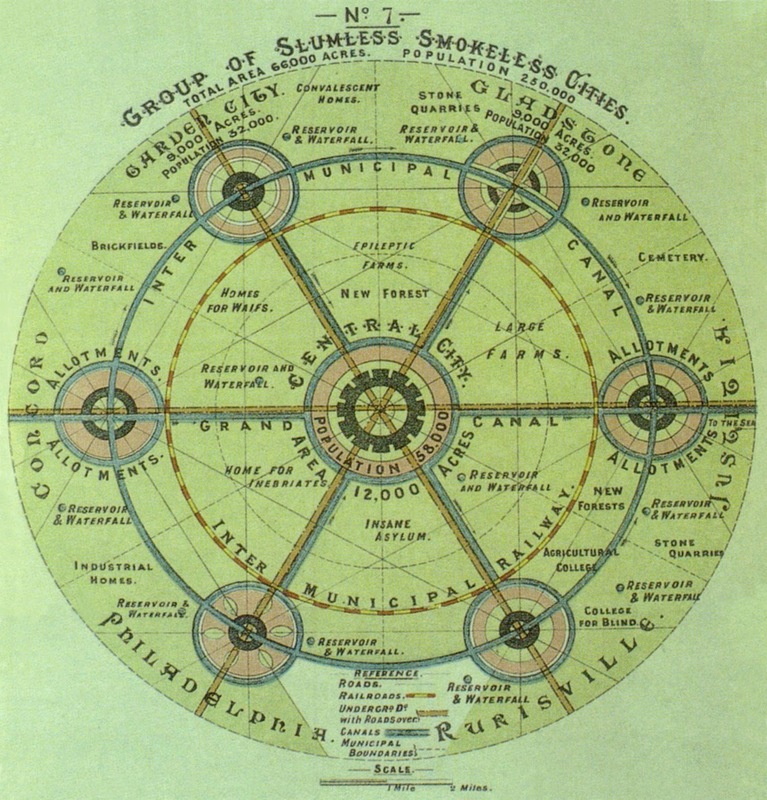 The garden cities should contain workspace for craftspeople and their apprentices, and at the periphery allotments for vegetable gardens supplying produce to a central market place. Bicycles and bus service could provide transport, reducing the carbon footprint. There should be a library, an orchestra, a park, a school. The architects should plan and discuss the landscaping and buildings with those who will build and maintain them, immigrants and nationals, working and living side by side, learning each others’ cultures and skills. In this way there can be hope for families to have living and working space with access to land and fresh air and to create self-sufficient economies, with a family-run bakery, grocery, laundry, ironmonger. We need to return to that sense of economy, which in its Greek meant 'home'. To centre it on the home of the family, sheltering it, sustaining it, serving it. Without damaging the environment. 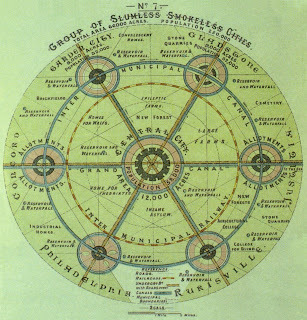 Negative models are the following: crowded inner cities with stone and cement paving; suburban subdivisions based on car ownership as in the US and in Melbourne, Australia, where matching homes are built each with their own lawns that use too much water, and which are serviced by vast shopping malls with concrete parking lots at a considerable distance from the homes; Roma camps set in polluted mud on the peripheries of cities. Such garden cities in Romania could reduce the migration of Roma to Italy, France and elsewhere, as these families seek space in which to raise their children and work alongside Romanians. Such garden cities in the British Isles could provide homes for British and Travellers also to live alongside each other. Vandana Shiva is speaking of the need for access to land, a diminishing of the control of multinationals creating debt cycles in agriculture, and of common good of seeds. http://www.navdanya.org/ When I spoke with her about this concept of garden cities for Europe she immediately saw that it provided, through the government, beneficial infrastructure for its citizens, the interlacing of the earth and the people. Which is the true task of government. 1. Samuel Taylor Coleridge's poem describes the yurt of gold and wicker as summer palace built by the nomadic Emperor Kubla Khan. This essay seeks to explore ways in which the EU could enable the housing of its own largest minority, the nomadic Roma, who themselves say they cannot accept social housing with cement or camps with polluted mud, but could acclimatize themselves to garden cities. In poor housing they become ill with TB. Before, in their caravans with their outdoor living, they were free of the disease. 2. I am writing these lines following the May 7-9 State of the Union of the European Union in Fiesole and Florence where all these topics were under discussion except that of climate change. 3. Julian Benda, La Trahison des Clercs (The Betrayal of the Intellectuals), 1927, presciently saw the growing danger of nationalism. Germany, between the wars, on top of the costs of World War I, was made by the Allies to pay reparations, often funded by loans at interest. In turn Jews, because they were bankers, were scapegoated. The Holocaust by Germany thus had its partial cause in these reparations paid to France, Belgium; Italy and England. None of our nations is innocent. See http://en.wikipedia.org/wiki/World_War_I_reparations. 5. From the Fondazione Michelucci: Firenze: Tracce di un'altra storia/traces of another history, 2002; 1954-2004, Città nella citta: Il quartiere dell'Isolotto a Firenze, 2006; Firenze verso la città moderna: Itinerari urbanistici nella città estesa tra Ottocento e Novecento, eds. Andrea Aleardi, Corrado Marcetti, Giulio Manetti, n.d.; Firenze crocevia di culture, 2010.